Step 1. Complete 120 hours of approved education. The 12-Volume DVD set showing you close to 2000 scenes of real defects from actual homes. An 11 DVD set covering construction issues. A CD covering Florida topics. The 500-page manual with over 350 line diagrams, hands-on inspection procedures, marketing ideas, and more. 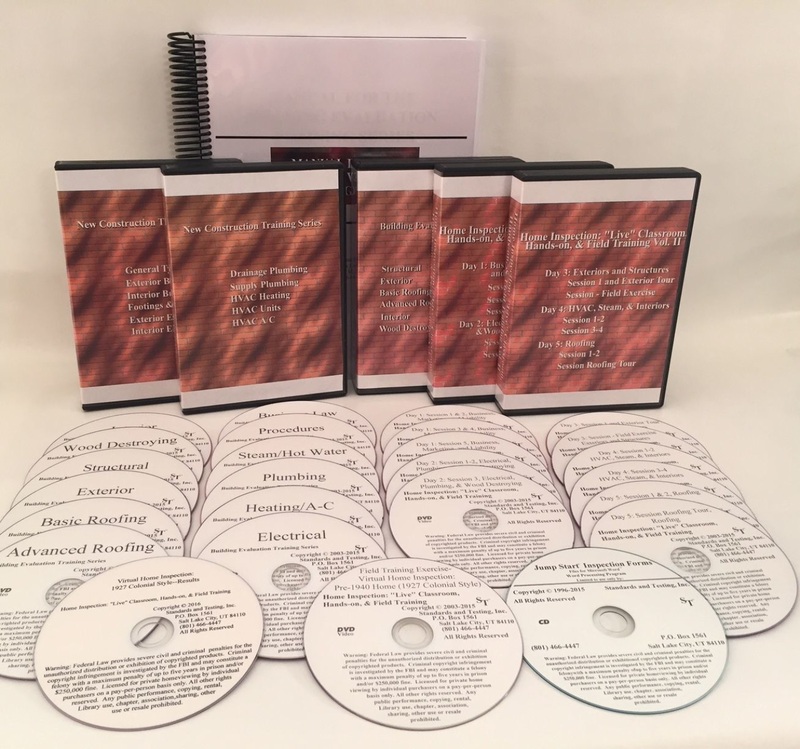 The 2-DVD Virtual Inspection set (regular price $100). As a Special Bonus, we include the Residential Inspection Forms on CD at no extra cost. Most companies charge $300 to $900 for inspection forms. Study Guide and 3 full length practice tests for the state exam. Step 2. Pass the state exam. Step 3. Complete your application with the state. 12-Volume DVD set showing you close to 2000 scenes of real defects from actual homes. 11-Volume DVD set covering construction issues. Residential Inspection Forms on CD. Analysis. This opinion/analysis information is not to be treated as legal advice. Please contact an attorney if you have legal questions. 1. An authorized government employee of the United States, this state, or any municipality, county, or other political subdivision who is conducting home inspection services within the scope of that employment, as long as the employee does not hold out for hire to the general public or otherwise engage in home inspection services. 2. A person acting within his or her authorized scope of practice as licensed under federal, state, or local codes or statutes, except when such person holds himself or herself out for hire to the public as a "certified home inspector,""registered home inspector," "licensed home inspector," "home inspector," "professional home inspector," or any combination thereof stating or implying licensure under this part. 3. An officer appointed by the court. 4. A person performing safety inspections of utility equipment in or on a home or building or other duties conducted by or for a utility under chapter 366 or rules adopted by the Public Service Commission. 5. A certified energy auditor performing an energy audit of any home or building or other duties conducted by or for a utility under chapter 366 or rules adopted by the Public Service Commission.History. s. 2, ch. 2007-235. This section excludes various government, court, and utility employees (sections 1, 3, 4, and 5 respectively) from the licensing requirements. Other individuals that are licensed by other already existing licensing authorities, such as engineers and architects doing what engineers and architects normally do are also exempt as long as they do not hold themselves out to the public to be home inspectors (section 2). 1. "Department" means the Department of Business and Professional Regulation. 2. "Home" means any residential real property, or manufactured or modular home, which is a single-family dwelling, duplex, triplex, quadruplex, condominium unit, or cooperative unit. The term does not include the common areas of condominiums or cooperatives. 3. "Home inspector" means any person who provides or offers to provide home inspection services for a fee or other compensation. 4. "Home inspection services" means a limited visual examination of the following readily accessible installed systems and components of a home: the structure, electrical system, HVAC system, roof covering, plumbing system, interior components, exterior components, and site conditions that affect the structure, for the purposes of providing a written professional opinion of the condition of the home. History. s. 2, ch. 2007-235; s. 16, ch. 2010-106; s. 8, ch. 2010-176. This section shows that the coverage of the licensing law is limited to 1 to 4 family dwellings, that doing free inspections are not covered by the licensing law (such as a contractor doing an inspection on a home his child is buying), and identifies or limits the coverage of a home inspection to the opinion of the home inspector of readily accessible items that can be visually evaluated --a home inspector is not expected to evaluate items that are not visible nor accessible.